I decided to buy a totally new engine from First Kick Scooters because I needed a P200 engine and it had an electric start feature. My brother is an electronic engineer and promised me he could figure out how to make it work. The engine itself fits into the VBA frame with very little problems. A P200E gas tank (with oil tank) will be located so that I can keep the autolube ability of this engine. 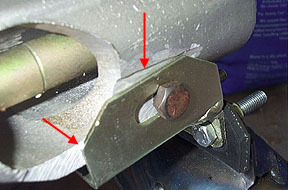 The oil sight glass will go through a new hole in the frame (see frame modifications). 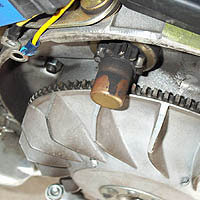 The electric start system works by using an electric motor to extend a gear onto a toothed flywheel. 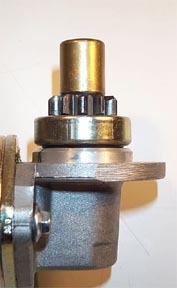 Below are shots of the motor and how the process of it turning extends a small toothed gear (similar to the kickstart gear) which turns the flywheel. 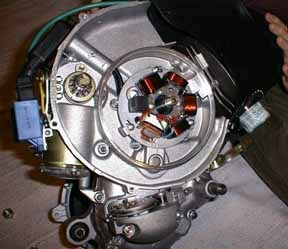 Below are shots of the toothed flywheel in the bike and also removed to show the full ring gear. 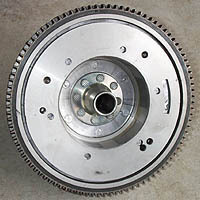 The gear is a metal piece pressed on to the aluminum flywheel. I guess people in the UK are familiar with this system but this is new to me...we'll see how it works. The bike uses a special rectifier and battery (see electrical page) which are different than a standard P200E. The only other addition to the engine is an expansion pipe from PM Tuning in the UK to give a little more power up the hills. I talked to the guys at PM Tuning who recommended a 118 main jet and an NGK B85EGV spark plug to run this pipe with a standard engine at sea level. The pipe quality is really nice but the fitting was another story. I tried to fit the pipe to the new engine and I was a little disappointed to have spent so much cash on a pipe and not have it fit. 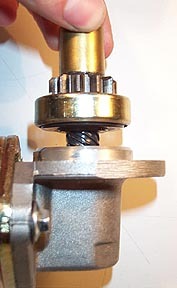 The diameter of the connection to the barrel was fine but the little slit that is cut into it to allow it to tighten on the barrel stub was too long. Even with the pipe pushed all the way down to the barrel fins, the slit was allowing a hole straight through to the inside of the exhaust. We removed the pipe and welded up the bottom 3/8" of the slit and tried again with better success. The mounting bracket from the engine swing arm to the pipe didn't fit either. Luckily since the engine was not yet in the bike I could easily take a grinder to the swing arm and remove about an 1/8 of an inch as marked below with arrows ....hate to think what it would have been like if the motor was in the bike!! For fun we also installed this pipe on my brother's P200E and there is a full installation page showing the process here.